Effective immediately, the GDTA is announcing a couple changes to the main route of the GDT as well as a two fantastic new alternate routes that will appear in Dustin Lynx’s forthcoming 3rd edition of his guidebook (expected to be released in early 2018). These new routes are all reflected in the GDTA map and GDT App. Wonder Pass is now the main route of the GDT into Mount Assiniboine Provincial Park from the south. To increase public safety and minimize displacement of grizzly bears from prime food sources at a critical time of the year, the upper Assiniboine Pass Trail is closed seasonally from August 1 to September 30. Equestrians are permitted to access Mount Assiniboine Provincial Park through Banff National Park via the lower Assiniboine Pass trail. 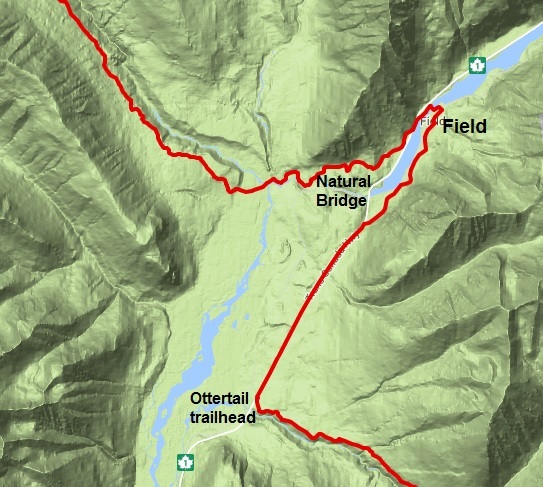 Field BC – From the Ottertail trailhead in Yoho National Park, the route no longer crosses the Trans-Canada highway to follow the railway tracks to Natural Bridge. Instead, walk next to Highway 1, northeast for 4.9 km until you reach a junction with a backroad on the south side of the highway. This backroad continues north 3.5 km on the east side of the Kicking Horse River and becomes Stephen Avenue in Field, on which the post office is located. From Field, follow the Tally-Ho Trail 4.5 km to Natural Bridge. This re-route adds some additional distance but most thru-hikers will be resupplying in Field anyway. 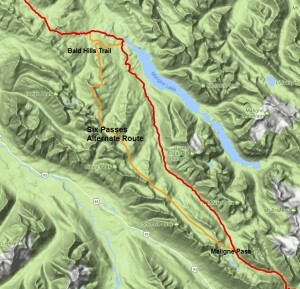 Six Passes Alternate Route (provided by the author of Hiking Canada’s Great Divide Trail guidebook, 3rd edition, Dustin Lynx) – 36.9 km instead of 31.6 km – Hikers only. If necessary, ask the Jasper park office for a 1-night random camping permit on this alternate route. This is one of my favorite hikes of the entire GDT, a real gem. I’ve hiked and skied it. I loved it both times and I highly recommend it. I did not include this alternate in previous editions of the guidebook because of the viable trail and facilities in the valley. When the decommissioned Maligne River trail becomes impassible however, this alternate will be the only viable link for the GDT route through Jasper National Park. It does involve some easy scrambling but nothing like the Barnaby Ridge alternate in section A or the Coral Pass alternate route in section C. The route-finding is easy and the hiking is unparalleled for cross-country travel. There is plenty of water en route between each of the passes. Don’t attempt it too early in the season due to snow and caribou calving. Late July to late September is the optimal period. The caribou-rutting season begins in late September. Parks Canada advises visitors not to travel from then until late October. They won’t issue a random camping permit for the route during periods that are sensitive for the caribou. The key to the alternate route is to line up all six passes and keep an eye on them as you descend through the subalpine valleys. This route follows the base of the unbroken and impressive escarpment of the Endless Chain Ridge. There are lakes, waterfalls, alpine meadows and continual vantage points. It is a strenuous route with a total 2057 metres elevation gain and 2597 metres loss. The route is suitable for running or fastpacking but there is technical footing in the lower meadows between the passes, where tussocks (small, grassy mounds) form. From waypoint e22 at the shallow lake on Maligne Pass, hike cross-country 2.5 km up to Pass #1 at 2492m elevation. From there, look northwest and line up the next pass in the chain. Descend into the long meadow to a low point of 2023m at km 9.5. Climb steeply up to Pass #2, 2225m, at km 10.4. Still following the rock wall northwest, descend to a low point of 2065m at km 12.1. You ascend to 2315m Pass #3 at km 13.2. From Pass #3, the route goes slightly more north, descending to a low point of 1922m at km 15.9. It angles up to a Pass #4, east of Sympathy Peak at km 17.8 and 2228m. Descent to a marshy low point of 2084m at 19 km. Ascend past two alpine lakes to 2335m Pass #5 at 20 km. Finally, descend to 1985m at 21.9 km before climbing up to Pass #6 at 2260m and 24.9 km. Instead of dropping down over this pass, as you have become accustomed to, angle up to the barren ridge crest to the north. Follow this ridge crest right up to the cairn on the impressive summit at 2568m. The route follows the ridge that goes directly east from the summit, down through some steep terrain. Be careful not to dislodge a rock if you are following someone else. It is a brief but easy scramble down. The angle of the descent lessens as the ridge broadens. The now easy ridge walk curves to the north. Stay right on the ridge crest, clambering over a couple of minor rock steps, eventually joining the Bald Hills trail at 29.6 km at a cairn on a 2374m ridgeline summit. 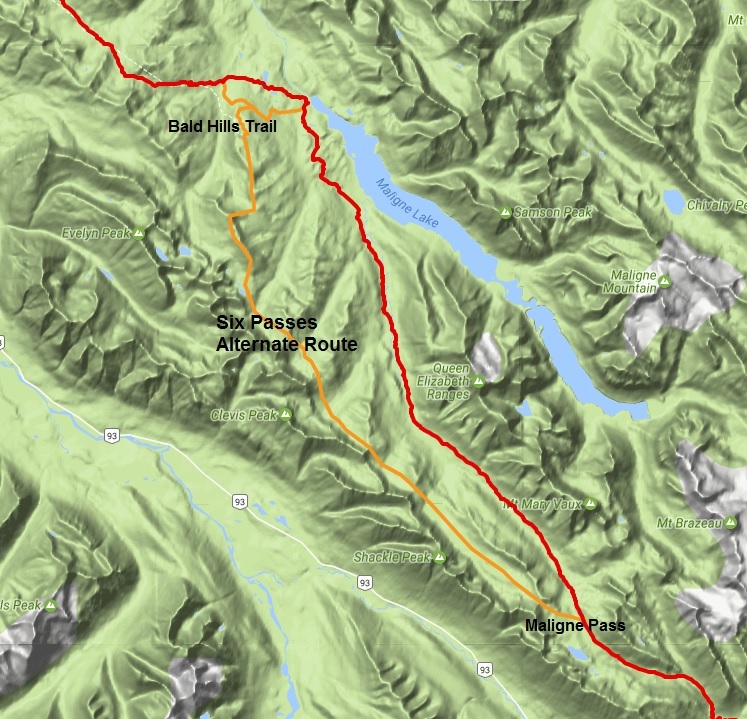 Good, signed trail brings you down the remaining 7 km along the ridge and then down through forest to rejoin the main route at the Bald Hills trail junction, 200m from the trailhead kiosk at the Maligne Lake parking lot. Shortcut: There is a trail junction 2.5 km before reaching the parking lot – perhaps 750m down from the lookout, in forest. If you turn left, you will reach the Evelyn Creek campsite on the Skyline trail in 2.7 km and bypass the busy trailhead at Maligne Lake. This shortcut shaves 7.3 km off the main route, nearly making up for the extra distance of the entire alternate route. 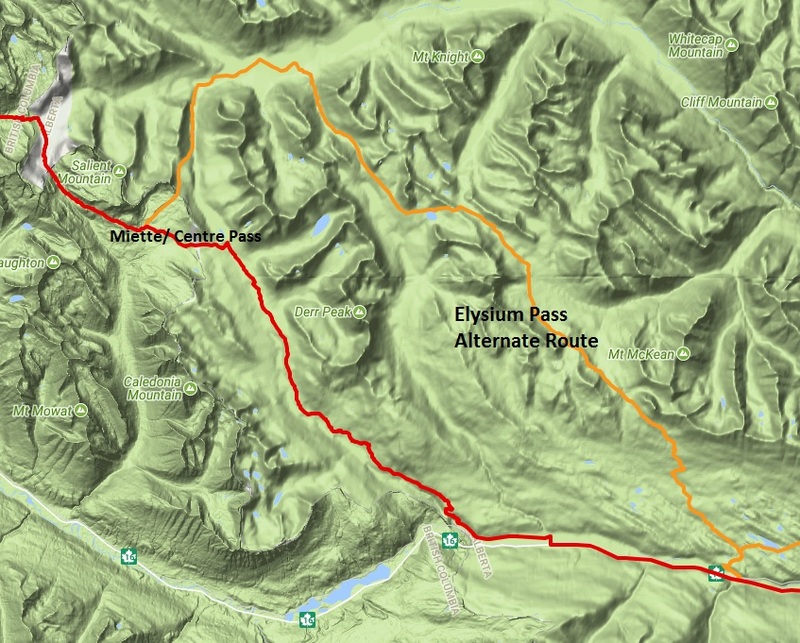 Elysium Pass Alternate Route – UPDATED in 2018 (provided by the author of Hiking Canada’s Great Divide Trail guidebook, 3rd edition, Dustin Lynx with additional trail description courtesy Zdenek Sychrava) – 53.3 km instead of 50.7 km. This alternate route is for experienced thru-hikers that crave the high alpine, cross-country travel and remote wilderness. Dogs are permitted here as well as horses. The Elysium Pass trail is a horse trail but I can only see them travelling as far as the ‘notch’ mentioned in this description. If you commit to this route, expect 6 km of slow bushwhacking into and out of the Snaring River valley. 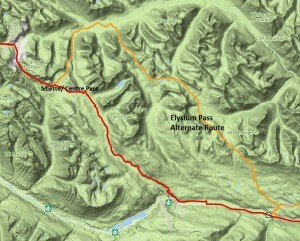 The Elysium Pass alternate route starts at the Dorothy and Christine Lakes trailhead on the Yellowhead Highway, 12.2 km from the start of Section F, in Jasper. The trailhead is well marked and it has a large gravel parking area. 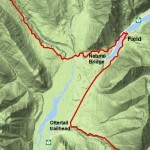 The route follows a gravel road for 200m and crosses the railway tracks and then a bridge over the Miette River. From the Elysium Pass trail junction at km 3.0 on the Dorothy-Christine Lake trail, turn left and follow good trail uphill. Watch for tree blazes and diamond-shaped tin markers along the way. There is little water on this trail for the next 8.2 km to a spring. Only 100m past the spring, tucked under some large Douglas fir trees next to a very wet subalpine meadow, is a small campsite suitable for two tents, at km 11.3. The route continues, following good trail through subalpine meadows to an incredible viewpoint at km 13.0 at 2123m elevation. From here you can look northwest and see Elysium Pass and Elysium Mountain. To the right (north) of Elysium Mountain is Mount Monarch, hulking in the distance. Monarch will be your companion for the next day as you walk around its eastern bulwarks and cut around a hidden lake cradled on its northern flank. 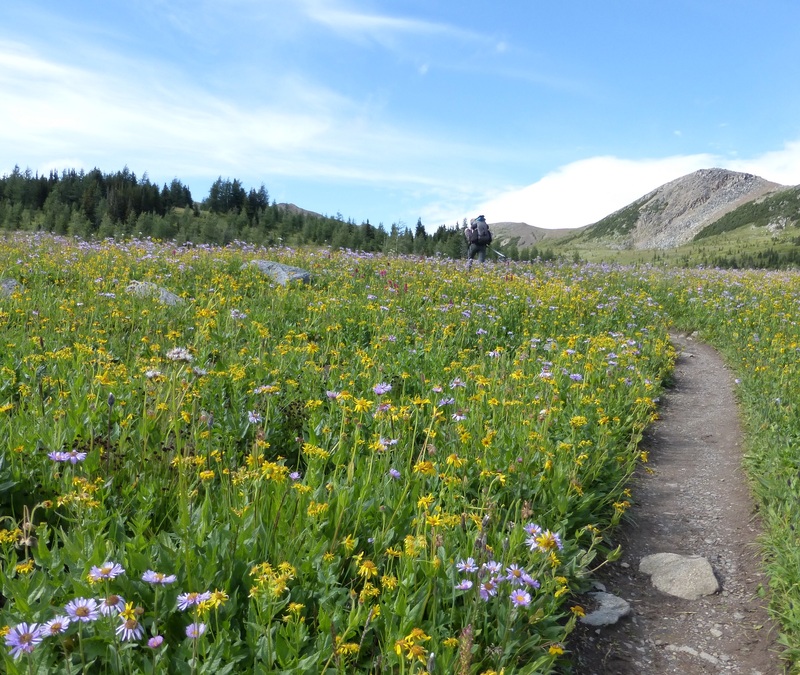 In 6.1 km you reach the edge of a prominent boulder field in Monarch Meadows. While cutting through the boulders is kind of fun, the faster route is to skirt around them to the east, through the wet meadows. The route continues northwest for 4.4 km up to a narrow alpine pass on the eastern side of Mount Monarch at km 26.2. Continue over the pass to the northwest for 700m. As you walk you will see a continuous cliff band about 150m tall between you and Mount Monarch to the west. Follow the base of this rock wall and watch for a break where a steep scree slope angles up to a notch. Don’t go beyond the 700m mark. If you do, you will begin a steep descent to the northwest into forest. Instead, turn southwest and follow the steep scree up to the notch in the cliff band. The notch is 90m above this point and only 400m hiking (11 U 0402432m E 5876414m N, or 53.029367, −118.458533). From the notch at 2207m elevation, descend west, aiming for the northern shore of a lovely round lake that you reach in 1.1 km. Start angling up to the west from the lakeshore through the alpine and in 1.6 km reach a 2108m high point on a ridge. Contour around the ridge to the north into the Derr Creek valley. Don’t drop down to the creek. Keep above treeline and aim for the obvious pass at the head of Derr Creek valley. Rock-hop a creek in 1.2 km at 2052m. Continue northwest for another 2.0 km to the broad alpine pass at 2030m at km 33.2. A well-worn game trail leads over the pass and into the drainage heading north-northwest. A short distance later the trail disappears. The terrain is open and provides easy hiking for the next kilometre until it reaches a tributary creek from the east. The valley begins to steepen and narrows from this point. Dense vegetation and steep banks along the creek will occasionally force you to climb up the hillside to avoid the obstacles. In 2.8 km, you will reach open terrain at the south end of a small lake. Although the flat terrain provides visual relief, it is wetland terrain and not suitable for hiking. From this point, continue along the eastern shore for 1.1 km to the north end of the lake and the outflow creek. The terrain will vary and pockets of dense pine will pose as obstacles. As you near the north end of the lake the terrain will steepen and force you to climb up and around the steep bank before you can descend to the outflow creek at the north end of the lake. A logjam at the outflow provides dry passage to the western side. From the north end of the lake at the outflow creek the terrain becomes even more difficult. Terrain along the creek is extremely steep and not recommended. Instead, follow a faint game trail heading northwest from the outflow that climbs up and around the shoulder of the mountain to an elevation of 1810m. The trail will fade quickly but as it does continue to contour around the mountain at 1810m. In approximately 650m you should encounter a small bench in the hillside where a steep but open slope heading northwest presents itself (N5305.042 W118 34.103). The slope drops 130m before it begins to easy off and enters the forest. In wet conditions you can expect a very challenging and slippery descent. Any natural support during your descent will be limited to handholds of thin branches from the brush that covers the slope. After the steep descent, the terrain will enter the forest and slowly ease over the next 900m until it reaches a bench on the hillside at an elevation of 1570m. From this point widely spaced thin pine trees and sparse vegetation will provide easy hiking. Continue west from this point and stay at an elevation 1570m until you reach a swift but narrow creek. Ford the creek and continue west. 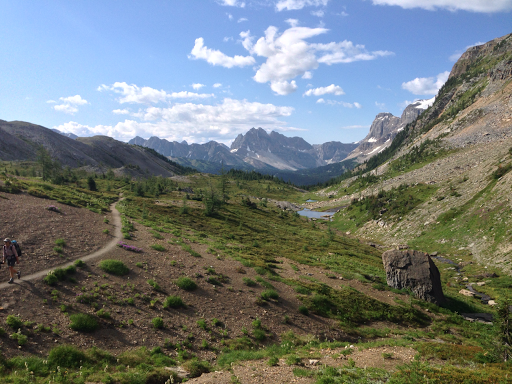 If you think that you will not be able to reach Miette Pass before the day is done, the area after the creek offers flat and open terrain ideal for camping. After the creek ford, continue west with a bias towards the base of the mountain. The vegetation and tree spacing will slowly begin to thicken. Blow downs will increase and you can expect your pace of travel to diminish significantly. In 2.9 km you will reach a tributary creek. After crossing the creek the terrain will become even more challenging, however the occasional game trail provides temporary relief through the dense forest. Blow downs, steep banks and moss covered rocks pose as obstacles and in 1.8 km you will reach a tributary creek flowing from the Miette valley that parallels the main creek. Follow the tributary upstream and south towards Miette Pass. Travel is slightly eased along the tributary but rocky terrain, dense vegetation and blow downs will continue to be obstacles to your progress for the next 1.2 km before you reach the talus slope. From the talus slope, continue south up the valley for another 1.5 km to the base of a series of small lakes. The terrain will vary between the open talus slopes and sections of dense forest but navigational challenges are eased by the open terrain. Once you reach the small lake, make your way through the large boulders towards the southern lake. In 500m a cascading waterfall formed by large boulders provides a scenic resting spot for the weary hiker. As you approach the southern and largest lake, stay on the western side and aim towards the grassy slope at the far end of the lake. This will be the obvious choice as steep terrain, boulders and dense pine line the opposite shore. As you make your way along the western shore, follow the open grassy terrain as it begins to gently climb the hillside. Do not follow the inflow creek upstream. The open grassy slope will form a natural pathway and in 500m you will reach the ledge of a steep bank that overlooks the inflow creek. Follow the forested ledge for a few metres until you reach a tributary stream flowing from the western hillside. The stream marks your ascent route up to Miette Pass. A steep climb of 220 vertical meters over the next kilometre will bring you into the alpine. Terrain along this section is varied and steep. Once you reach the alpine and the end of the steep climb continue to follow the stream to its headwaters at the base of the mountain. From the headwaters, head south and over a small saddle at which point you will be able to see Miette Lake in the distance. From the saddle, open alpine terrain and easy hiking await. Enjoy the view and your reward for the long fought struggle. From the saddle stay high and contour around the base of Mount McCord for 1.4 km to the southeast shoulder of the mountain. 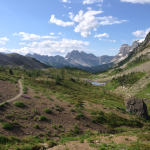 From this point, you can continue along the ridge heading southeast to the boundary monument at north Miette Pass for a scenic alternative or head southwest through the vast open valley to meet up with the main trail in 2.8 km. In either option, follow the creek that flows southwest through the valley to reach the confluence and waypoint f7. Flagging and a faint trail should be visible on the western side on the creek after the confluence and marks the beginning of the main trail.